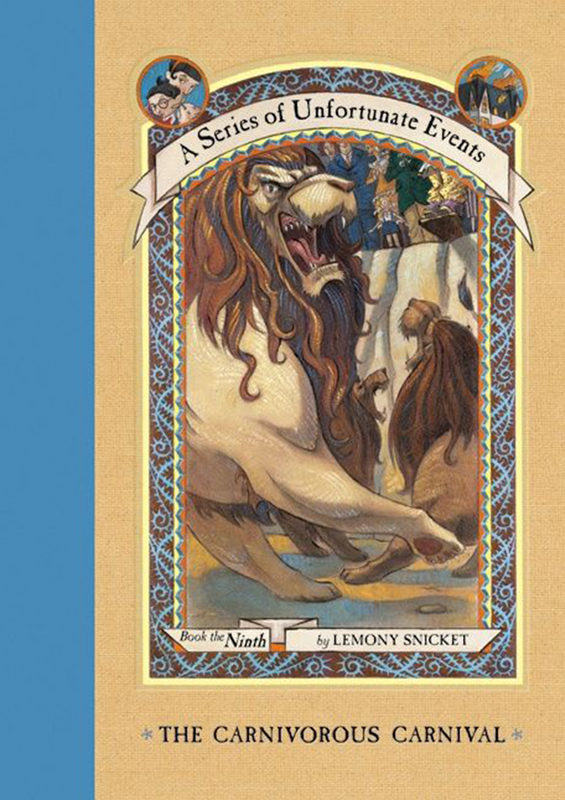 The A Series of Unfortunate Events books continue to go down an interesting path as the Baudelaires somehow manage to survive all the increasingly daunting challenges thrown their way. The last book had them separated for much of the book and Violet in dire peril. But thankfully their dedication to one another combined with their resourcefulness saw them through to the end. The Carnivorous Carnival continues the story of these adventures as the Baudelaires seem to be at greater risk more than ever. Gone is the old pattern of the books starting with a new guardian taking charge of the children. They've bene on their own since the last book and things seem to have gotten even worse with how this book starts. We still don't officially know what VFD is, where it is, and if this information can be of any help to our protagonists. Meanwhile Count Olaf continues his own schemes that can only get worse over time. 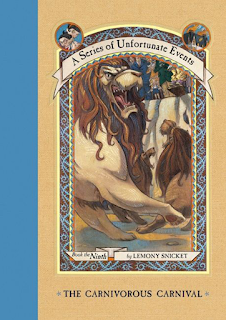 Synopsis: The Carnivorous Carnival is the 9th book in the A Series of Unfortunate Events book series written by Lemony Snicket. This book is also the last once covered by the second season of the Netflix show. At the end of the last book, the Baudelaires had escaped the chaos of the hospital by sneaking into the trunk of Count Olaf and his compatriots. He is traveling to meet with Madame Lulu, a supposed psychic at the Caligari Carnival who seems to have a knack of finding things out. And his current challenge to her is to find the Lemony Snicket files, which may hold the secret to VFD. But in order to avoid the danger of being so near Count Olaf, the Baudelaires borrow a page from his playbook and disguise themselves as circus freaks. And this leads to them being hired to be part of the carnival as they have a good collection of "freaks" already there, which is a decent enough cover while they try to find out what Madame Lulu knows. But as she can only answer one question per day, this means that Count Olaf and his cohorts are staying at the carnival longer and he decides to take over its operations entirely in the interim. What I Liked: This whole book has the Baudelaires dancing on the edge as they are pretty much hiding right underneath Count Olaf's noses. But for some reason the disguises are as effective on Olaf as his disguises were on members of law enforcement and other authority figures. But still they're constantly dodging danger with little to show for it. But the book isn't without its silver lining as there is a lot to be discovered about VFD and Madame Lulu is a lot more than she appears to be. And while the information doesn't come easily it's right there for the taking and even just the potential of getting answers makes for quite the odd thrill while reading the book. What Could Have Been Better: This book still feels like a diversion from the main action and while it is interesting it's not quite where we want to be. It's almost the book equivalent of a television bottle episode since they don't really go anywhere significant and somethings happens but not enough happens. Count Olaf is still evil and his whole mini-scheme at the end was quite terrifying but not all that much in terms of long-term impact for the bigger narrative arc of the series. And this far along in a 13-book series, you can't help but expect things to turn around any time now but we're still getting baited with possibilities. And that's getting tiring by now. TL;DR: The Carnivorous Carnival is a good enough adventure on its own but it does still feel like they're delaying things a bit too long before explaining key things like VFD in more detail. At least we get some crazy interesting new characters in the form of the circus freaks even if not all of them seem to be actual "freaks" in the traditional sense of the term. Thus the book only gets a decent 3 freaking things that the Baudelaires can do while posing as a circus act out of a possible 5.